This guide covers the best mops for hard floors including laminate and wooden floors. We have featured more traditional mops along with those with detachable pads. Also reviewed are three of the best spray mop models. These are great on wooden and laminate floors as they have an integrated spray or water bottle built onto the mop; expect to pay a bit more for these versions though. 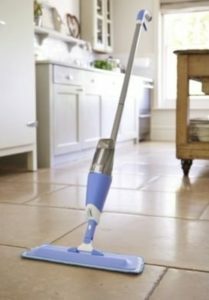 Whether is a dry or spray mop you are looking for then we hope that this guide, with our comparison chart and review of the top floor mops, will help make your search easier. The product name might be a bit of a mouthful but the Vileda Easy Wring and Clean Turbo set is a highly rated bit of kit from a leading floorcare brand. It’s not cheap but this Vileda set does feature a number of innovative features in an attempt to justify the higher price tag. The bucket itself features a unique “turbo” mechanism that is operated by a foot pedal on the bucket. You put the wet mop head into the bucket basket, then operate the pedal which spins the inside of the bucket basket, in turn, draining water from the mop. The idea is that this allows you to use a different amount of water for different floor surfaces. This is a great feature as in practice it only needs a few operations of the foot pedal to rinse the mop. The bucket is also quite large and features a maximum water level indicator that is easy to see and a spout for easy pouring out the water. 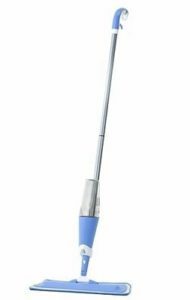 The mop itself is also well designed with a telescopic handle that extends to 130cm in length. The head also pivots so you can get under furniture easily and the plastic head attachment is triangle shaped (like some models of steam cleaner) which makes it easier getting into corners. 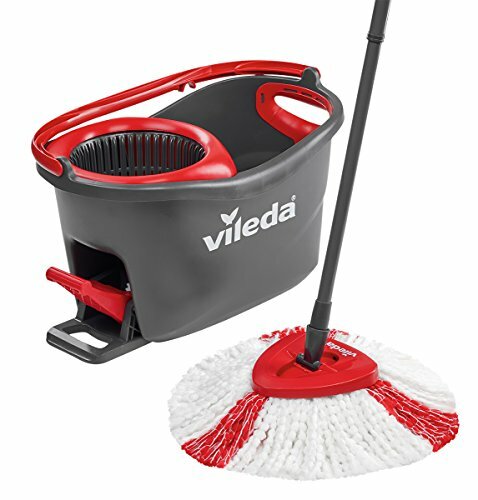 The “2 in 1” mop head features microfibre cloth and “Red Vileda Yarns” for better cleaning. The mop head can also be machine washed at 60degC and they are also available as separate refill packs. This dust mop from Draper is perfect for hardwood floors. It traps dirt and dust and other small particles perfectly. It also features an extendable handle, making cleaning a breeze. The handle extends from 0.85 meters to about 1.5 meters. 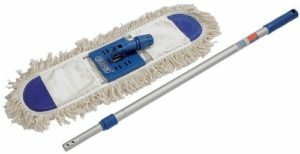 This is a very popular mop with lots of positive reviews. This one is definitely one of the best dry mops for wooden floors. 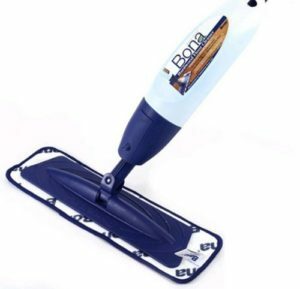 When you buy this mop, however, keep in mind that it is only a dry dust mop, but with a 600mm wide cleaning head it does this job very well. This dust mop does not have the standard shaggy mop head. Instead, it has static cloths, which are easily attached. The cloths pick up dirt and dust flawlessly and when you’re done they’re easy to remove and discard. Usually, when you buy it five disposable cloths are included with the mop but you will have to purchase refill packs. This mop also has a swivel handle, which makes it easy to get in those hard to reach places, like under furniture. 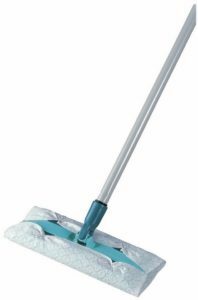 This mop can even be used with microfibre cloths or sanitising cloths that you can find at most supermarkets. It is also incredibly sturdy and won’t break easily. The only drawback on this mop from Leifheit is that it is really only best for quick dustings between full cleanings rather than heavy duty moping. Lakeland also took their own approach to moping, and it’s a consumer favourite. 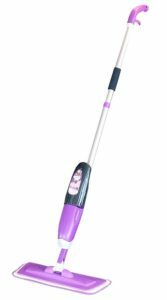 This mop has a flat base and a swivel handle so that you can reach all the places in your house. What’s great about this mop, however, is that it can be a wet or dry mop. It has a built-in water canister that you can push a button and water will squirt out in front of the mop. Or you can just use it for a simple dusting. The water canister is super easy to refill, and by adding just a dash of your favourite cleaner, you can get sparkly clean floors in just minutes. No more dragging around big dirty buckets of water to mop with. The handle is plastic instead of steel, however, most people find this much more comfortable and don’t have any problems with it. The Bona Professional Spray Mop seems to have an endless number of features, but here’s a quick summary of the best. First, it is a spray mop like the Lakeland, so you don’t have to drag around a bucket of water with you. It is also super easy to use. The microfibre pad that comes with it is washable, so you don’t have to throw it away and replace it after every time you mop, saving you lots of money in the long run. The pad can be washed up to 300 times, so unless you mop every single day, enough to get it really dirty, this single pad will last you over a year. It is also ergonomically designed so that you can keep a firm grip on it while it gets in all those hard to reach places. It doesn’t leave any residue or streaks behind, just squeaky clean floors, truly one of the best spray mops available. Some people have complained about having to wash the pad; they like disposable ones better. But this is really just a matter of opinion, and it still works great. Lastly is the Vorfreude Floor Spray Mop. Another great spray mop that is easy to use and makes cleaning a breeze. This one is 100% reusable and never needs to be replaced. You can also choose whatever is best for your floors and spills. Hot or cold water, bleach, or a few essential oils, this mop can handle it all. The sturdy metal handle is not only sleek,but made to last. The best thing, however, is the lifetime guarantee that is included. If anything ever breaks they will ship you free replacements. The only drawback of this mop is that the handle is not extendable. This hasn’t really proved to be a problem for most people though.